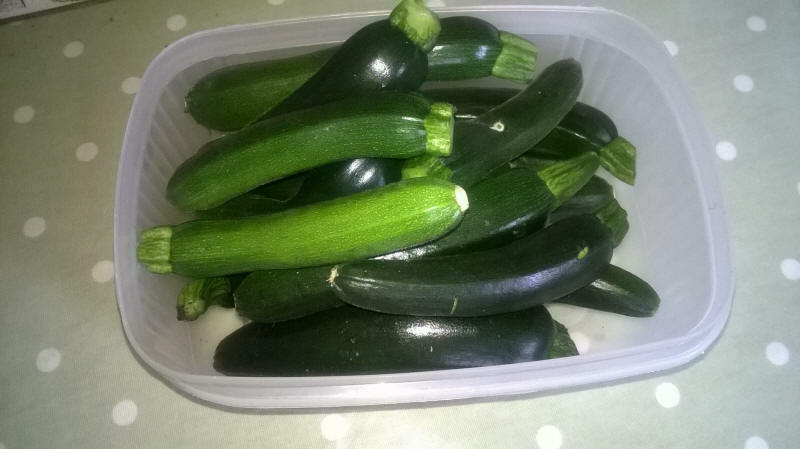 Our first picking of courgettes and just about enough to make courgette soup for tea tonight. This is our recipe. Peel and chop 2 large onions and cook gently in large pan with a little butter or oil. The idea is to soften them but not colour them. Slice 2lb of courgettes into shillings and add to pan when the onions begin to soften. Cook gentry and let the courgettes soften a bit. Add about 1 pint of vegetable stock - this is a rough measure and now increase the heat and simmer until all the veg are soft. Now remove from the heat and blitz to form a thick, green soup. Some people would add cream but I don't think it needs it. I don't add salt either you might want to. Ladle into bowls and you can embellish with chopped chives if you like. We serve with a slice of bread.